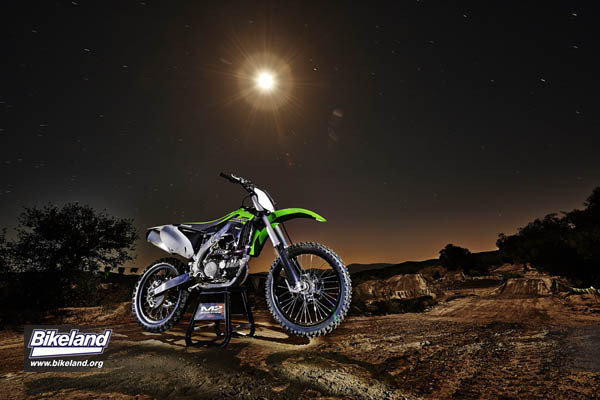 Several significant updates grace both of Kawasaki's leading dirt offerings for the 2015 model year. Following another highly successful year in competition, improvements to the four-time AMA Supercross Championship-winning KX™450F will keep it on top in 2015! It’s no secret that Monster Energy Kawasaki has been dominating the AMA Supercross and AMA Motocross series, with Ryan Villopoto piloting his Monster Energy® Kawasaki KX450F race bike to four consecutive AMA Supercross Championships in 2011 through 2014. Villopoto’s skills are undeniable, but the race-ready Kawasaki KX450F allows the legendary racer to brake later, carve deeper and accelerate harder thanks to a technology package and powerful yet tractable motor unrivaled by any production motocross bike. 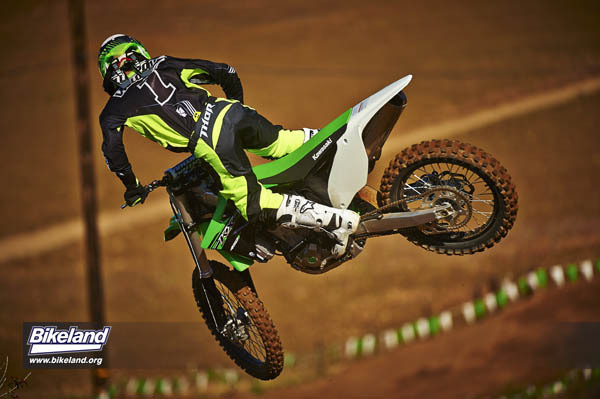 2015 sees the KX450F rise to another level with greater rider adjustability along with chassis, suspension and brake upgrades aimed at maximizing performance for a variety of riders in most every condition. 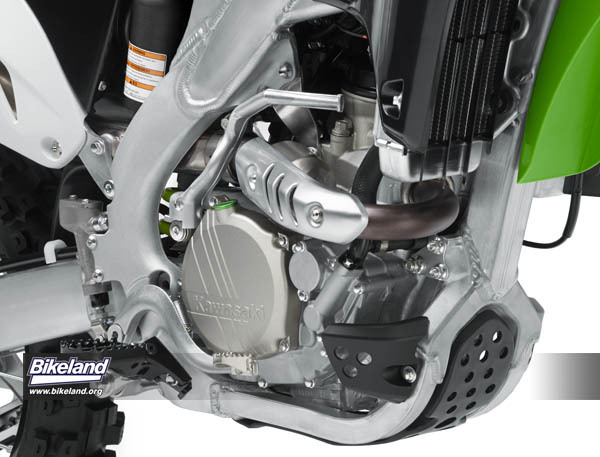 This ensures it is now easier than ever to access the performance of the KX450F and tailor it to fit the rider’s needs. What hasn’t been said about the legendary 450cc motor in the KX450F? 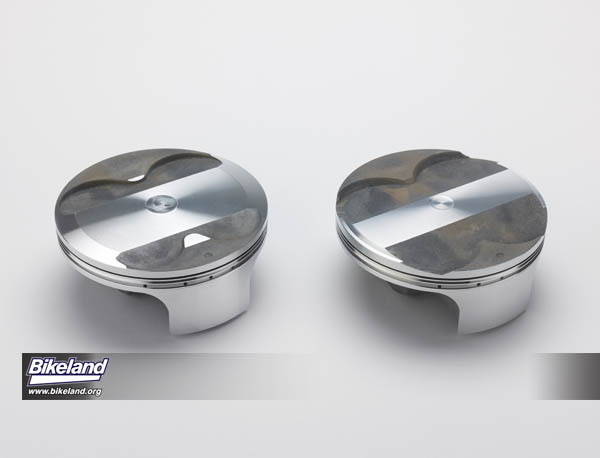 It’s powerful, tractable and reliable, yet Kawasaki took it upon itself to also improve its design with a revised Bridged Box piston for increased durability and a high compression ratio (12.8:1 from 12.5:1 in 2014). The cutting edge piston design was pulled straight from the factory racer team and features short skirts with reinforced external ribs to improve combustion efficiency and reliability. It provides a stronger mid-range hit as well as a stronger feeling at high RPM. 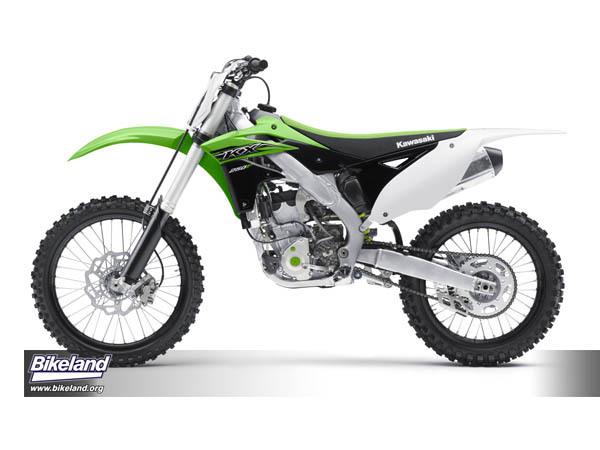 From the saddle, the rider will experience the proven top-end and over-rev performance that the KX450F is known for, while maintaining its impressive torque. This championship-winning powerplant develops massive torque from the low revs and continues to pull all the way through the mid- and upper-range of the power curve like no other engine in history. 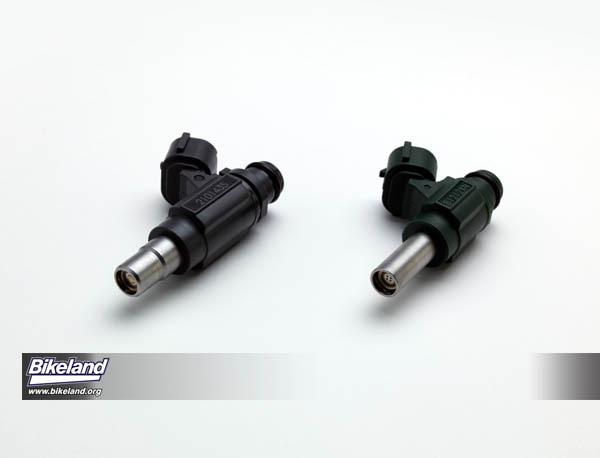 Of course, the revolutionary DFI® Couplers (Standard, Hard, Soft) are still utilized on the DFI system, allowing riders to change the fuel injection mapping in a matter of seconds to suit a variety of riding conditions. Easy access to the DFI coupler cap means no additional accessories are needed to alternate between pre-preprogrammed maps. The rider simply connects the appropriate coupler cap to immediately activate an ignition mode that matches local track conditions. The ECU system was revised for 2015 with new programming to enhance traction by retarding the ignition when rear-wheel speed increases too quickly (from sudden, excess wheelspin). The ECU is also fully re-programmable. Custom maps can be created using the optional accessory Kawasaki Racing Software Kit giving riders total power adjustability. This is the same tool used by Kawasaki factory and privateer teams in AMA and FIM racing. The industry-first factory Launch Control System also remains for 2015, helping to ensure hole-shot supremacy. The push-button activation retards ignition timing in first and second gears, which, in turn, maximizes traction. Once the rider shifts into third, normal ignition mapping is resumed and full power returns. An engine like this requires the grip and ride quality to match, and this is delivered by the upgraded suspension components for 2015. 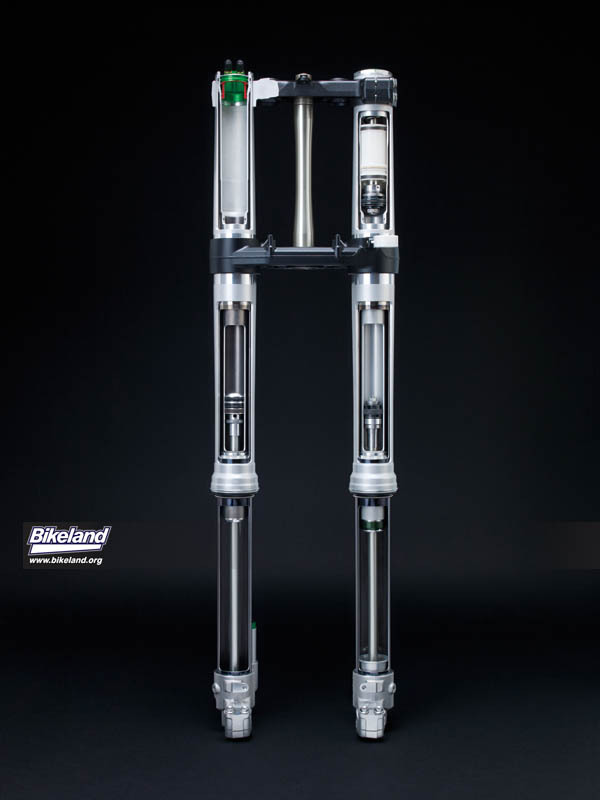 A high-tech Showa Separate Function Fork (SFF) with a Triple Air Chamber (TAC) separates the damping forces into the left fork tube, while the pneumatic spring is housed on the right tube for less friction, better movement and a lighter fork. The innovative SFF-Air TAC fork is derived directly from Villopoto’s race bike and is revolutionizing the motocross market with better small- and large bump absorption, increased adjustability and superior reliability compared to conventional dual-spring forks. The reduced weight and inertia of the pneumatic spring keeps the wheel in contact with the terrain thanks to very little resistance during rebound compared to conventional spring forks. These high-tech forks are also suppler over small bumps, while offering more resistance to bottoming. As its name suggests, the Triple Air Chamber features three separate chambers with individual air volumes that allow the ultimate in adjustability, thanks to individual tuning. An inner 145psi high-pressure pneumatic chamber works in harmony with a 7.25psi low-pressure outer chamber and a 130.5psi high-pressure lower chamber. These replace the heavy, friction-inducing spring for the ultimate in function and tuning. There is also less oil contamination from the metal-on-metal wear suffered by conventional internal fork springs. A titanium coating on the inner tubes improves fork action with diminished friction, and the silver external finish is factory fresh. 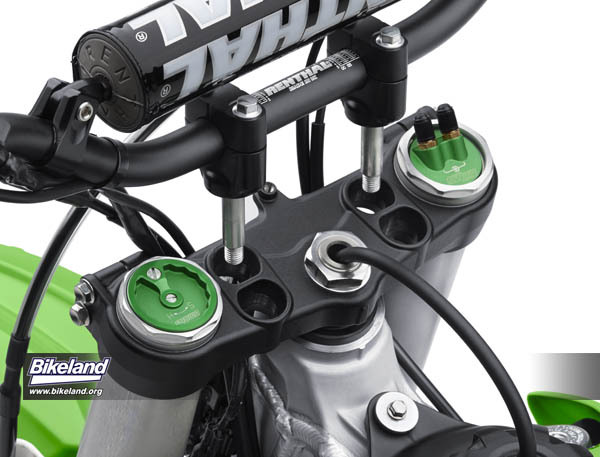 Suspension tuning with the Showa SFF-Air TAC is easier than ever thanks to the Kawasaki Genuine Accessories 0-300psi Digital Air Pump that is included with every KX450F. The Digital Air Pump makes life easier and helps riders quickly adjust the high-pressure SFF-Air TAC forks. The digital display offers increased precision when setting air pressures, and the casing stores DFI Couplers for the fuel injection system for better organization on race day. Out back, the Showa shock with Uni-Trak linkage has revised valving for stronger damping. This results in improved high-speed handling, greater stability and improved performance when landing. The race-oriented rear suspension offers class-leading action and adjustability that is on par with the matching Showa SFF-Air TAC up front. The suspension is finished in “works black” for a race-ready style as competent as its performance. The Kashima coating inside the shock body reduces friction and improves suspension action. The fully adjustable unit allows for precise adjustments to help keep the rear wheel planted and the rider out front. 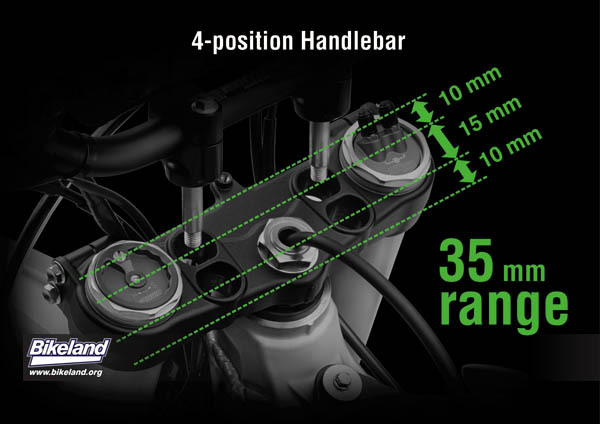 For ultra-competitive riders who are always looking for an extra edge over the competition, Kawasaki offers an optional rear suspension tie rod that is 1mm longer than stock. This simple yet effective modification can be used to reduce seat height by 4mm to give the rider greater control and adjustment. A fast engine isn’t the only key to winning races. Being able to effectively enter every corner from speed is also critical. 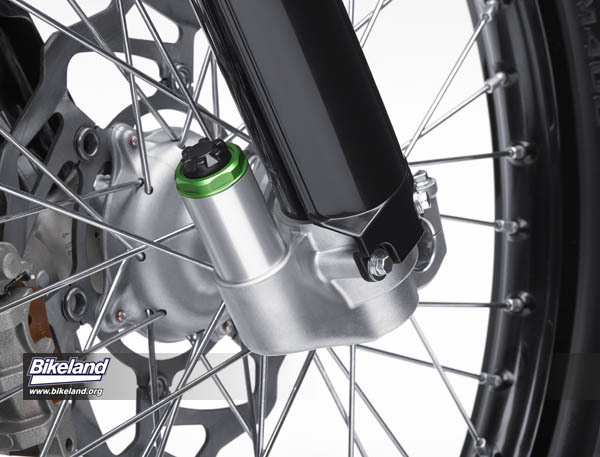 And Kawasaki upped the ante for 2015 with a new, oversized, petal-shaped front brake rotor from the renowned Braking company that increases stopping effectiveness, lever feel and consistency in all conditions. 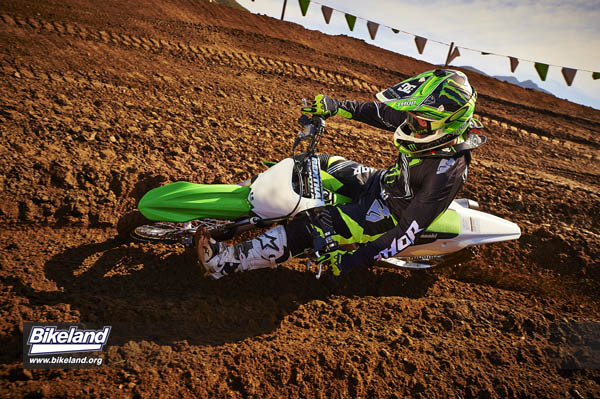 Braking is known for its innovations in the motocross brake market, and its products have made their way onto the 2015 KX450F to give the rider the ultimate control and feel. The first WAVE disc was developed and sold by Braking in 2000, and these new “petal” rotors are a testament to how far the technology has come in a relatively short amount of time. The larger 270mm front rotor was increased from last year’s 250mm part. 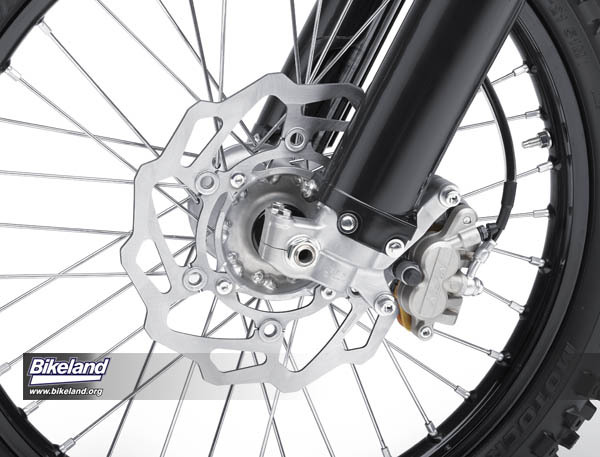 It is paired with a petal-shaped 240mm Braking rear rotor to give riders the ultimate feedback. The petal-shaped rotors shed even the thickest of mud, allowing riders to reach the limits of adhesion without fear of locking, maintaining the ultimate in communication between the tire and rider. As any racer knows, better braking translates into quicker lap times. 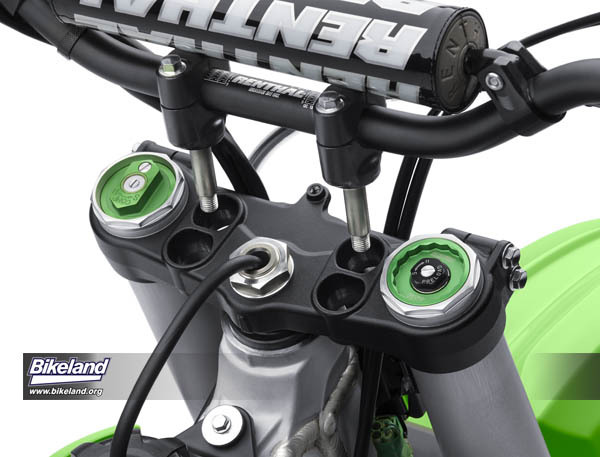 World-class suspension components are not effective without proper support, so Kawasaki’s engineers worked hard to improve handling and chassis feedback with tweaks to the auxiliary components supporting the slim aluminium perimeter frame. 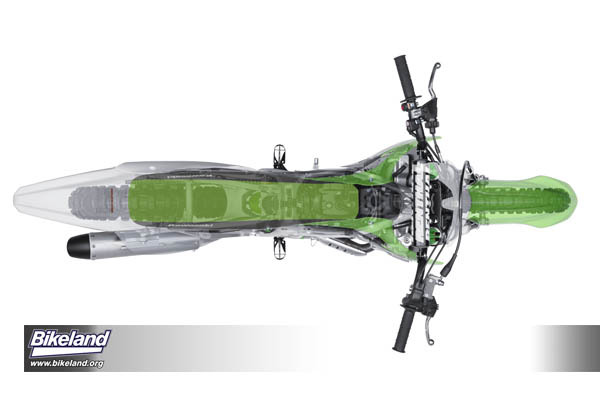 A new lighter rear subframe is shared with the lightweight KX250F, reducing the weight and improving mass centralization for quicker handling and a more nimble feel in the saddle – greater parts communization also means less out-of-pocket expenses for riders at the parts counter. The alloy swingarm, with its cast front section, twin tapered hydro-formed spars in raw aluminum finish, and forged chain adjusters are fitted with a self-locking rear axle nut. 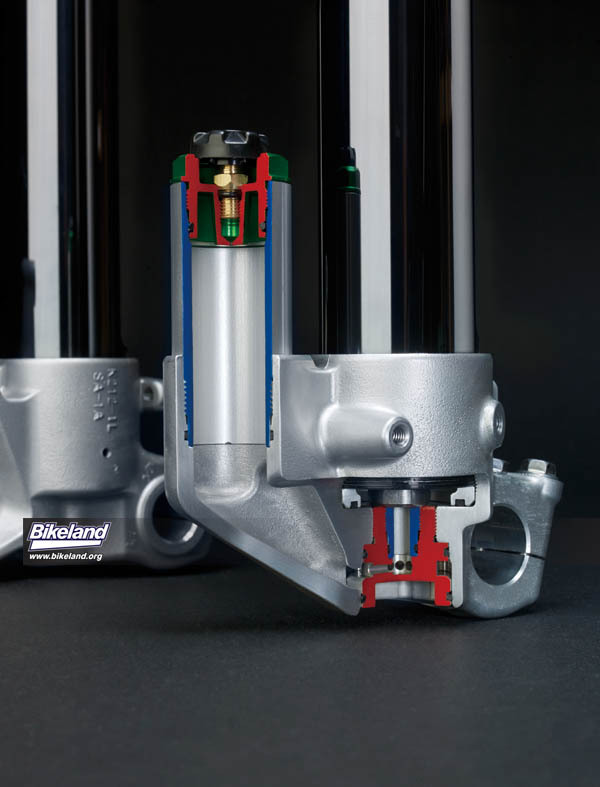 The design holds the 80 lb ft torque setting without the need of a cotter pin, providing more precise torque settings and ease of maintenance. Small improvements like this will make pit work easier for grassroots racers and track junkies alike. The axles are new for 2015, lightened by 31 grams front and 32 grams rear as a further weight saving measure to improve the overall feel. Kawasaki’s commitment to riders continues with adjustable footpegs and handlebars to fit various sizes and riding styles. The footpegs feature dual-position mounting points, while the multi-position handlebars feature four individual settings and offset clamps to suit riders of many sizes. Sparing no attention to detail, the seams between the radiator shrouds, seat and side covers are flush fitting. This helps avoid gear snags and allow the rider to change position and maneuver more freely on the bike. The compact fuel tank also forms a smooth straight line with the seat, allowing maximum rider movement. The 2015 KX450F looks the part thanks to its enhanced styling that features a Lime Green finish with factory-style graphics. The appearance is further highlighted with green engine plugs, oil cap and generator cover plugs, as well as green alumite suspension adjusters and black alumite wheels. The coated components not only look at home in the pits, but the durable finish is corrosion and scratch-resistant. Thanks to further refinement to an already class-leading performer, it’s easy to see why the 2015 KX450F will continue its success on podiums across the country, thanks to a proven pedigree and Kawasaki’s steadfast commitment to excellence and improvement. 449cc, liquid-cooled, DOHC, four-stroke single with legendary Kawasaki power! The record books don’t lie. Whether it’s Team Green™ amateur racing, professional AMA Supercross or Motocross, the most successful 250cc motocross bike in the four-stroke category just got even better thanks to a series of upgrades designed to maximize the performance of this already impressive motorcycle. The Launch Control mode, plug-n-play DFI® Couplers and Separate Function Fork (SFF) that were introduced last year are all carried over. 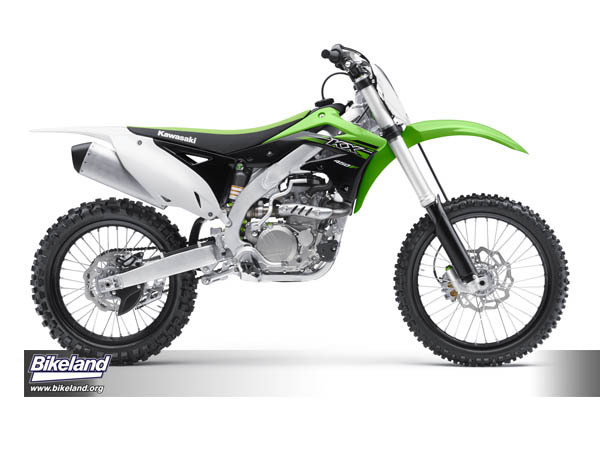 New for 2015, the Kawasaki KX250F receives updates to those Showa SFF forks as well as oversized Braking rotors, further improved engine tuning and adjustable footpegs and handlebar clamps to fit riders of all sizes. 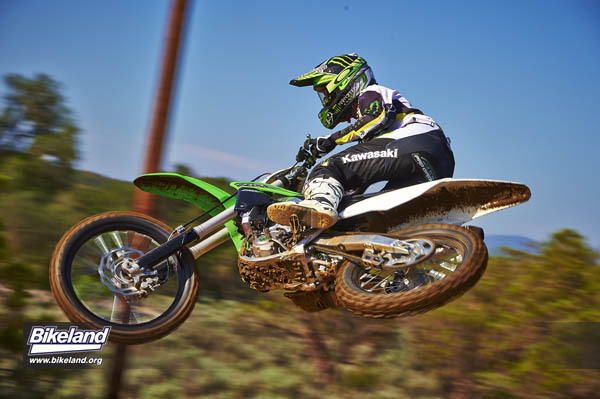 Like its championship-winning bigger brother, the Kawasaki KX™450F, all aspects have been honed to offer improved performance in a variety of conditions. The 249cc motor receives a new, reinforced Bridged Box piston borrowed directly from the factory race bikes. 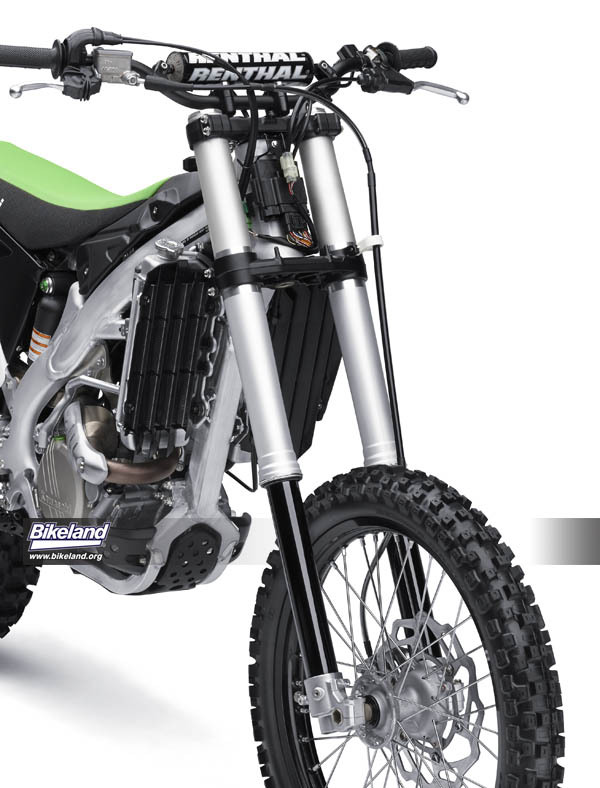 Like the KX450F, the light and strong Bridged Box piston design for the KX250F has short skirts with reinforced external ribs for increased strength. 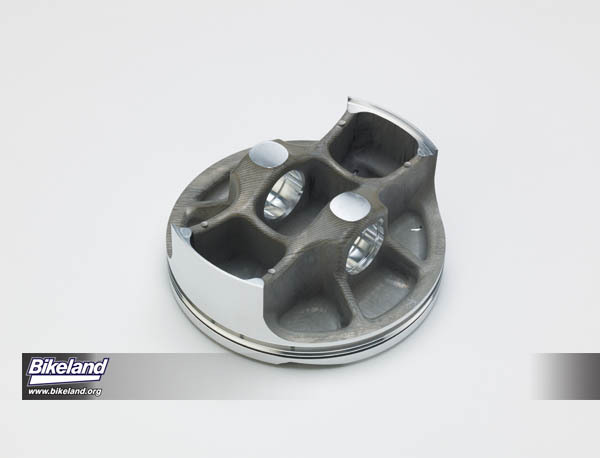 Added reinforcement for 2015 increased the weight of the new piston but a new piston pin was lighter than last year’s model, contributing strength and reliability without any weight penalty. The exhaust system employs a short header and resonator chamber to enhance low-end power and provide strong top-end power. 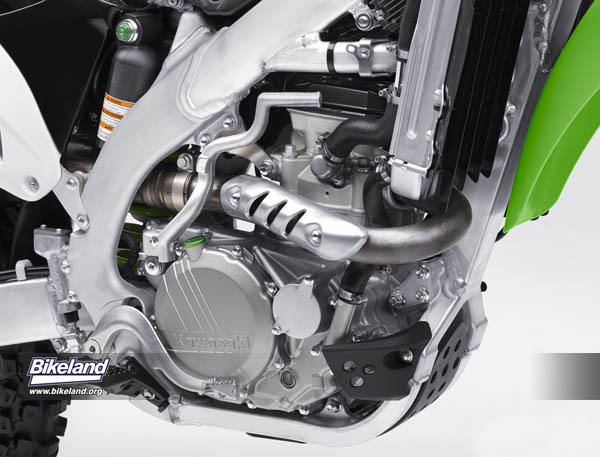 It also has a short, KX450F high-volume muffler that assists with mass centralization and makes good power, yet its large cross section restricts noise levels to an AMA race-legal 94dB. Further engine improvements include a new magneto rotor with greater inertia to match the increased acceleration performance. The standard rotor now weighs 9.5kg-cm², which is up from 9kg-cm² on the 2014 model. The combined effects of the engine’s improvements in both throttle response and power under-the-curve mean better drive out of the corners and more grunt for steep inclines. 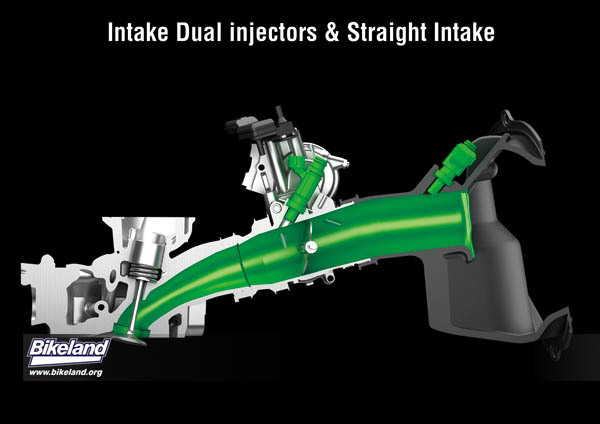 The Digital Fuel Injection (DFI®) system on the KX250F utilizes dual injectors that deliver a second squirt of fuel under acceleration to maximize the engine’s power and over-rev capability at high RPM. Introduced in 2012, this second injector is located upstream in the air duct, helping to create a wider and more potent powerband. The dual injectors are both fine-atomizing injectors with four holes. The upstream injector disperses particles with a droplet size of 120m, while the downstream injector was reduced to 75m for 2015. With a finer size and wider spray pattern, the downstream injector contributes to a stronger low- to mid-range power, along with improved response and quicker acceleration. These enhancements were also thanks to revised ECU settings to match the injector and magneto rotor changes. The ECU has three pre-programmed ignition maps that allow riders to quickly and easily change DFI settings without needing to access a laptop or electronic device. So engine maps can be quickly switched between the three settings – Standard, Hard (terrain) or Soft (terrain) – to suit riding conditions. This is achieved by simply replacing the DFI coupler cap located on the side of the steering head. No additional tools or accessories are needed to change between pre-programmed maps – simply swap the appropriate DFI Coupler cap to select your desired ignition mode and feel an immediate change in power. The ECU is also fully reprogrammable, allowing custom maps to be created using the accessory Kawasaki Racing Software Calibration Kit: the same tool used by Kawasaki factory and privateer teams in AMA and FIM racing. 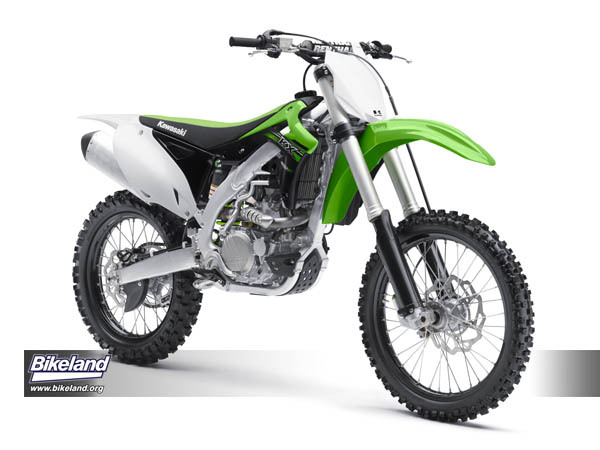 Additionally, the KX250F retains the factory Launch Control mode that was the first of its kind for any 250 motocross bike when introduced last year. The system works by retarding the ignition in first and second gears, which allows the tire to find grip in low traction situations, helping the rider maximize traction and get a good start. Launch Control mode is activated by simply pressing a button on the handlebar when in neutral, first or second gear. Shifting into third gear automatically deactivates the system to return ignition timing to the stock setting. This high-tech system is most effective on concrete starting pads or other slippery surfaces. The new 270mm “oversized” front Braking rotor easily corrals the increased speed of the Kawasaki KX250F, giving the rider stronger performance and more control. For 2015, both the front and 240mm rear rotors are a new factory-style petal disc that look stylish and shed dirt more easily. The high-friction brake pads grip the new rotors via a pushrod-type front master cylinder that helps ensure strong braking force. The front brake was tuned to be particularly effective on initial bite and in its mid-stroke action to provide enhanced feel and control. 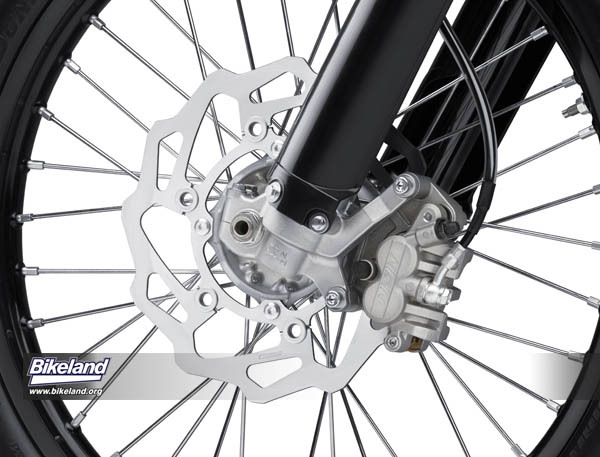 The rear rotor is mounted to a rib-less rear hub with butted spokes that reduce the unsprung weight. The axles have also been reduced in weight, saving 31 grams on the front and 32 grams rear, with all these changes helping riders achieve even more podium finishes this season. 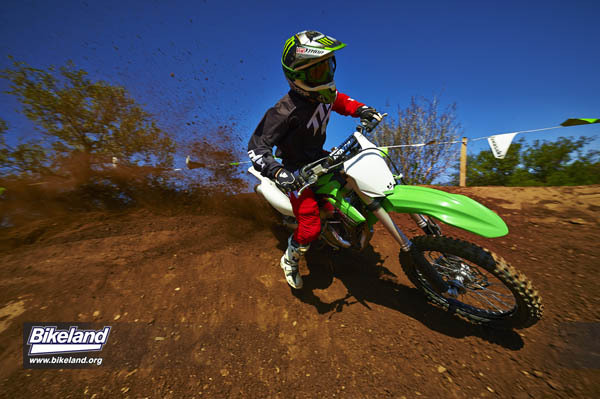 In 2011, the Kawasaki KX250F was the first production motocross bike to feature the Showa Separate Function Fork (SFF Type 2), and for 2015 its valve settings have again been revised to improve damping for high-speed handling and stability, keeping the Kawasaki in front of its competitors. 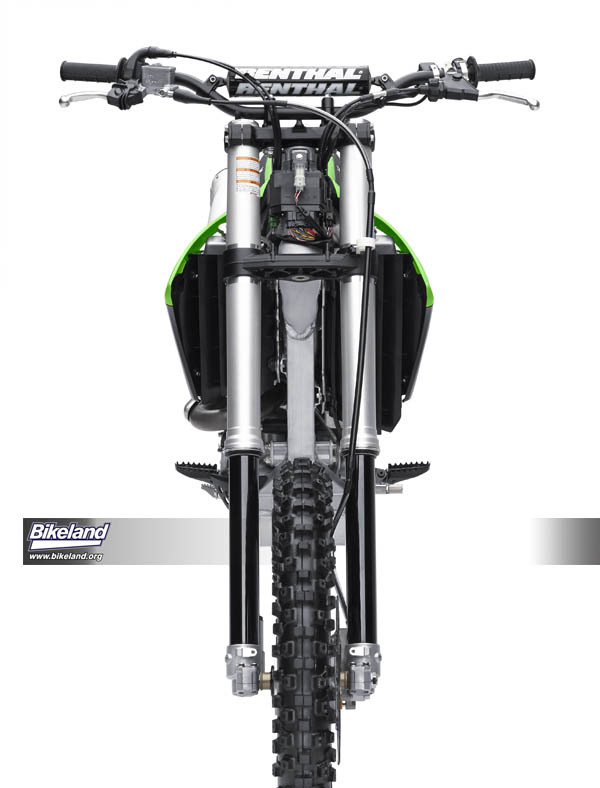 The 48mm SFF forks on the KX250F separate the damping and bump absorption duties into the individual fork tubes. The right fork leg houses the spring, which is easy to adjust, while the left fork leg contains the damping components that achieve the best small- and large bump absorption in its segment. The SFF assembly also means there is room for the preload adjuster. This significantly simplifies the task of setting the fork preload and front-end height. So rather than disassemble the forks, as you would need to do with conventional forks, Kawasaki’s SFF system means front and rear preload and height can be set with the simple turn of a wrench. Furthermore, the large fork tubes allow 30mm main- and 35mm sub-pistons that provide a smoother action and firm damping performance at lower internal pressure. The Showa forks have a super-hard titanium coating on the inner fork tubes to prevent abrasion, just like the Kawasaki factory team bikes. This reduces sliding friction and initial stiction to improve overall fork action. Green anodized caps and a new silver finish on the outer fork tube compliments the package and adds Works-racer style. Rear suspension duties are assigned to the Uni-Trak linkage and a Showa shock has firmer settings to match the front fork upgrades, providing the same high-speed handling and stability. The shock features high- and low-speed compression damping adjustment and there is also a self-lubricating alumite coating on the inner surface of the shock cylinder wall to avoid abrasion, reduce friction and smooth the suspension action. These features help increase rear-wheel traction and power transfer to the ground. 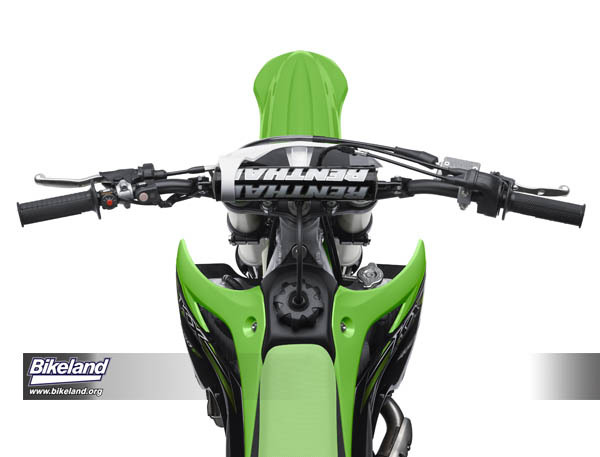 Continuing with the Kawasaki KX250F refinements, the slim aluminium perimeter frame receives the new lightweight subframe previously found on the KX450F for improved mass centralization. The frame features narrow main spars that give the rider better control and allow for greater movement in the saddle. 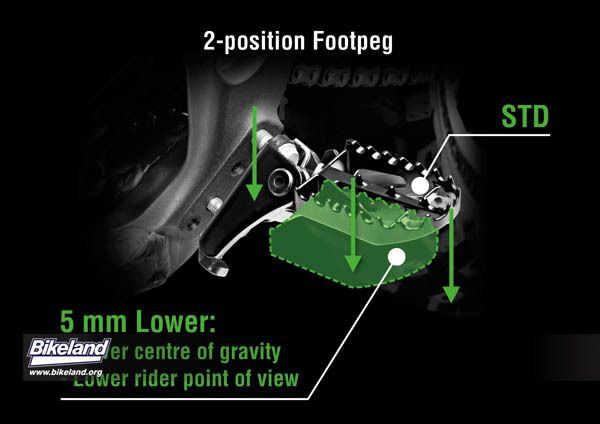 As an industry first for the 250 class, the increased adjustability of the KX250F extends to new, two-position, adjustable footpeg brackets that allow the rider to lower the position by 5mm, thereby lowering the center of gravity. 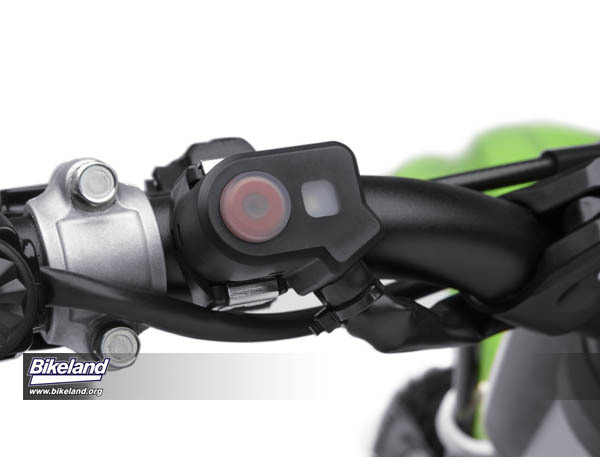 Like its big brother, the KX250F also has a new four-position upper triple clamp with two sets of handlebar mount slots. These offer the rider the choice of four bar positions, including 25mm forward, 15mm forward, standard or 10mm back. The result is the ultimate ergonomic adjustment for riders of many sizes and styles. 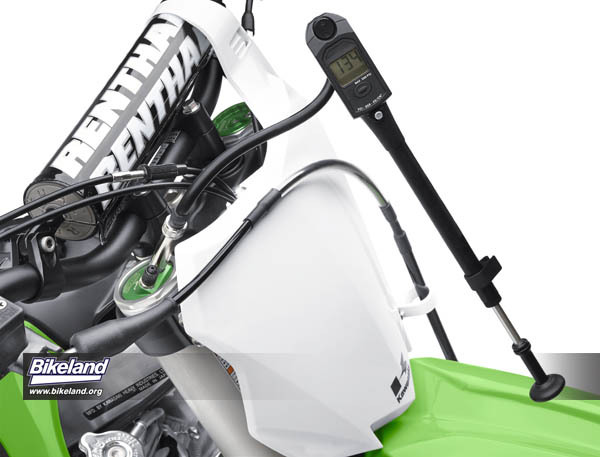 When combined with the almost limitless ignition mapping capabilities, thanks to the optional KX FI Calibration Kit, the Kawasaki KX250F is uniquely able to adapt to almost any track, any surface conditions and any rider. 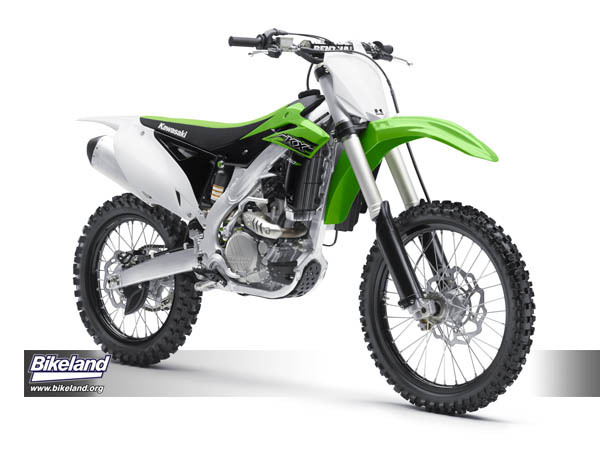 The KX250F also shares the enhanced factory styling of its 450F brethren, thanks to factory-style graphics and, new for 2015 are green anodized suspension adjusters, engine oil cap and generator cover plugs. 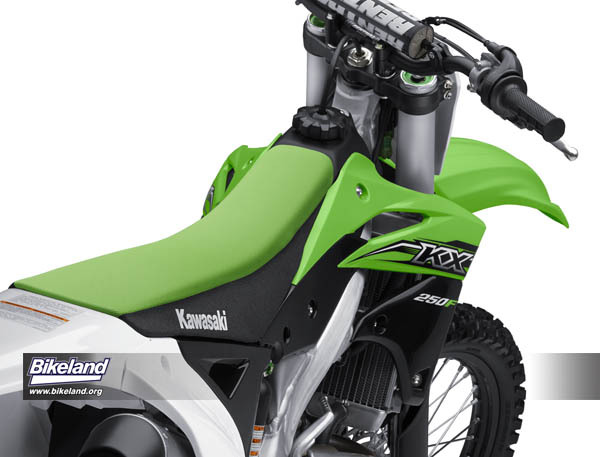 Along with the black alumite-coated wheels, the KX250F has the distinctive Kawasaki look. Owners will also appreciate embossed design on the clutch cover, which was designed to gradually reveal itself as contact from the rider’s boots gradually wears away the painted surface. 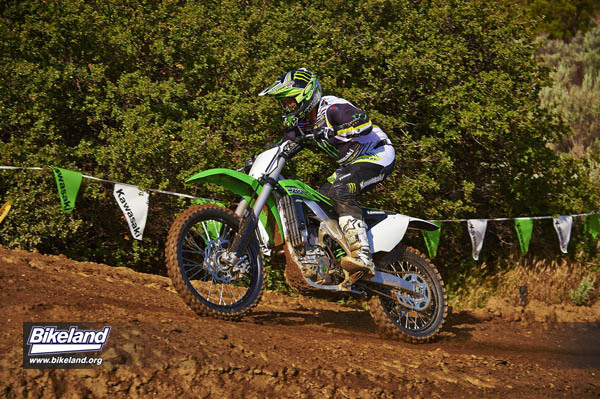 From its styling to the race-proven performance, all aspects of the 2015 Kawasaki KX250F have been addressed to increase its outright ability while also making it more accessible than ever. 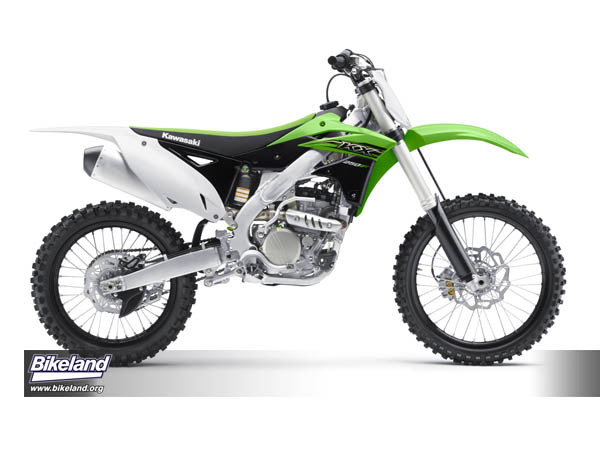 So whether you’re a weekend racer, or a track rider looking for a lightweight and capable mount, the 2015 KX250F has the ability to continue its reign over the 250F class.